Online consumer reviews are increasingly being relied upon by our customers to decide which business to hire for their job. The integrity of those reviews is absolutely paramount. 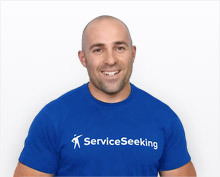 The following guidelines set out how ServiceSeeking approaches online reviews for both customers leaving feedback and businesses responding to a review left on their profile. The majority of reviews on our website are written by customers who have hired a business through the platform. Some reviews on our website are external reviews, written by customers that have hired a business outside our website. These reviews are disclosed as being “External Reviews” and you can read about them here. “Fast Feedback” allows businesses to give themselves a rating for a job they’ve done through our website. These reviews are marked clearly with a link to the Fast Feedback terms and conditions. You can read about Fast Feedback here. Businesses can purchase an upgrade called “Featured Reviews” where they can highlight their top 5 favourite online reviews. These reviews will be highlighted as “Featured Reviews”. Read more about Featured Reviews here. Our reviews reflect the opinions of the customers who have hired businesses that quote or otherwise appear on our website. Our general principle is that negative reviews about a business will be published. If a business receives a negative review, we invite them to post a public response. There are limited circumstances where we will ask for further evidence about a review including if a business says the review is fake or false. The removal of review content is only allowed on our website where it prevents fake, offensive, defamatory or irrelevant reviews from being published. We will do this to improve the quality of our reviews. We will not remove or edit negative reviews because of a commercial relationship with a reviewed business. If a businesses complains that a review is fake, or has the potential to be misleading, we will ask the customer to sign a statutory declaration as evidence that the review is true before publication. Until the statutory declaration is received completed and witnessed by a Justice of the Peace, the feedback will be in a “pending” state in our feedback audit queue until the signed stat dec is received. The form of statutory declaration we will accept is here. There are circumstances where a customer or person attempts to defame an individual or who writes a review that is likely lower someone’s esteem in the eyes of an ordinary reasonable person. In these limited circumstances the review will be rejected and the customer will be asked to resubmit it in a form that does not, or is not likely to defame the individual. We won’t accept profanity, obscene or crude language, personal insults, racial slurs, and similar language. Feedback and response should only discuss things directly related to the quality of the job and service provided. Don’t reveal personal information or anything irrelevant to the job. It can be frustrating to receive bad service or a negative review. But whether you’re a customer or business, leaving a threatening message — legal, personal, or otherwise — in your feedback or response won’t be tolerated. As a customer, you can’t make up a review or say that you have hired a business when they have not worked for you. If a business indicates your review is misleading, fake or false, you will be asked to submit a Statutory Declaration before we will publish it. The form of statutory declaration we will accept is here. If we have evidence that a reviewed business is responsible for the posting of fake reviews about itself or its competitors, we will remove offending reviews or ban the business depending on the extent of review manipulation. We will also take steps to detect and remove fake reviews. We will reactively (rely on complaints information) and proactively (using manual internal systems) seek out fake reviews including after they have been posted.